The reigning CIAC Class LL Champions were the consensus top team in Connecticut from the beginning of the season until an unexpected loss against Fairfield Prep on Feb. 7. Notre Dame-West Haven jumped into that spot on its way to a first unbeaten regular season in the history of the program. On Wednesday in front of a standing room-only crowd of 3,421 people in Hamden, Hillhouse-New Haven made its claim as to why they should once again be No. 1. The Academics trailed for only fifteen seconds en route to their first SCC Tournament Championship victory since 2013, downing the Green Knights, 70-62 at the TD Bank Sports Center on the campus of Quinnipiac University. “It was real important to make a statement toward states that we are the No. 1 team in the state and won’t just let anyone beat us,” guard Tyler Douglas said. Douglas was tasked with guarding the player named SCC Player of the Year before the game, Tremont Waters of Notre Dame. Waters came out and scored 16 points in the first half, but managed just six the rest of the way. Christian Adams was named the SCC Tournament Most Outstanding Player. He scored 21 points, including 12 in the first half. His two 3-point jumpers in the first quarter helped Hillhouse jump out to a 15-2 lead. Kasperzyk scored 23 points in the game for the Academics. 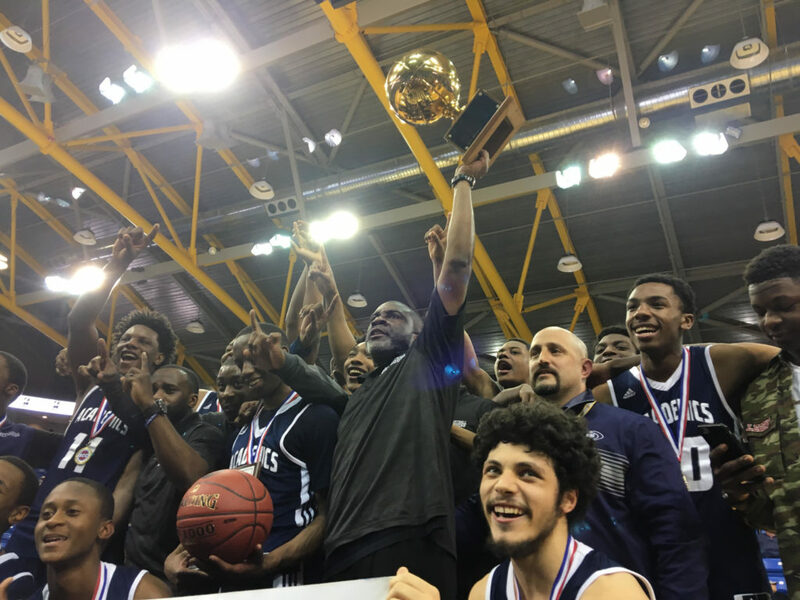 Hillhouse has won seven titles dating back to the SCC tournament’s inception in 1995. The game was the first sold-out game in Quinnipiac’s basketball arena since 2010.